﻿ Sorry for the delay in getting this recipe for you. We are all busy at this time of year, of course. In addition to the normal busyness here our poor cat, Rosie, started having distressing symptoms, requiring visits to the Vet. Finally, after a second round of x-rays, it was determined that she had bladder stones and needed surgery. Not good news! So that is what kept us away from the computer this past week. Thankfully, Rosie is finally on the mend after a rough first couple of days. We are so very grateful for being able to get excellent care, and for God's healing mercies for our beloved almost-four-year-old kitty. Preheat oven to 300 degrees. Butter a 9 x 12 inch baking pan well with butter. Blend nuts, sugar and cinnamon in a bowl. Into the buttered pan, one at a time, lay a piece of Phyllo dough and using a pastry brush, butter each sheet, until you have 8 pieces on top of each other. Sprinkle one cup of the nuts mixture evenly over the 8th layer of buttered pastry. Repeat steps 3 and 4 until you have used up all the Phyllo dough. You will (probably)end up with 4 or 5 layers of eight pieces of pastry topped with nut mixture, except for the top. Do NOT sprinkle the top with nut mixture--just butter the very top. 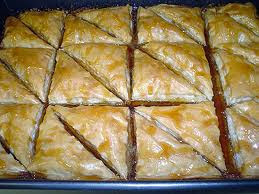 Then take a sharp, thin knife and cut the entire panful of Baklava into diamonds. CUT ONLY HALFWAY DOWN INTO THE PASTRY--DO NOT CUT ALL THE WAY TO THE BOTTOM. Cut into small bite-sized triangles, as this is very rich and that will be plenty. Bake in 300 degree oven for 1 hour and 20 minutes, or until golden brown on top. Remove from oven. Warm the honey in a small pan over med-low heat until hot but not boiling. Then pour it evenly over the entire top of the hot Baklava in the pan. Cool the pan on wire rack at least one hour. Then cover and let sit at room temperature until served. Enjoy making, and eating, this wonderful Greek dessert! Glad to hear Rosie is getting better. 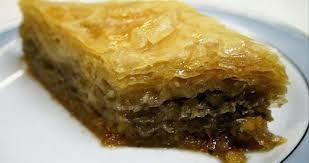 Thanks for the recipe...LOVE Baklava and this really doesn't seem as bad as I always thought it would be....Yes, tricky, with keeping the layers from getting dry, but not too many ingredients. I'm going to try this with some of Joy's honey. Yes, Joy's honey is the best! 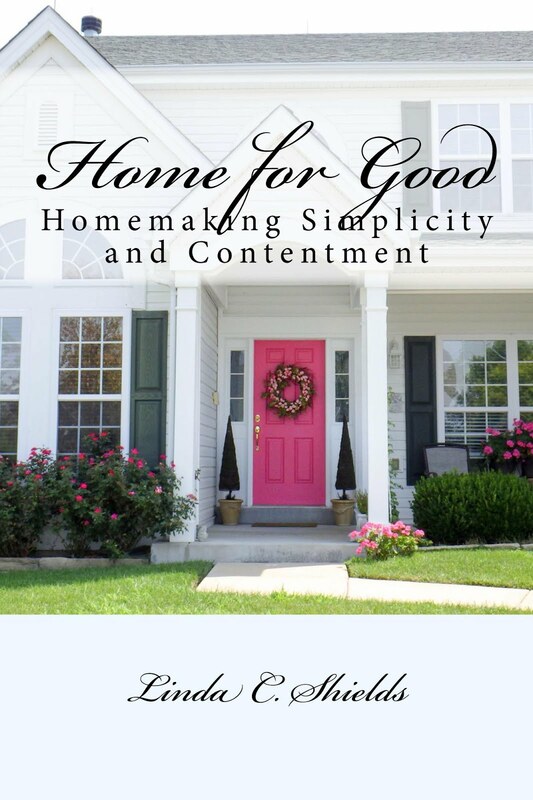 Let me know if you need a helper.